(Joshua Paladino, Liberty Headlines) As Sen. Cory Booker, D-NJ, spreads “love and hope” with his presidential campaign, he has also taken time to make false accusations against President Donald Trump. In a “misleading attack,” Booker claimed that Trump slashed federal funding for the Justice Department to investigate domestic terror groups, Politifact reported. 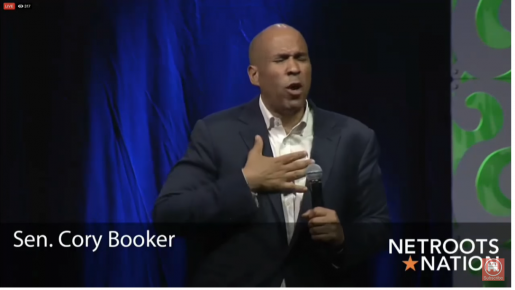 Booker told the lie at a CNN Town Hall on March 27. “For Donald Trump to cut funding — to cut funding from the Justice Department to investigate, I mean, he talks about terrorism all the time, but to cut funding to investigate these domestic terrorist groups, these white supremacist groups, is making us less safe,” Booker said, without evidence. Politifact sought answers from Booker’s campaign staff. When questioned about the supposed cuts to the Justice Department, they referenced cuts to the Department of Homeland Security. Booker’s staff said the Trump administration cut grants to Countering Violent Extremism, an Obama administration program aimed at dissuading American citizens from joining “extremist” groups. As Obama left office, DHS awarded $10 million in total to 31 groups. After Trump became president, DHS halted the grant payments to reassess the recipients. When DHS announced the recipients, only 26 groups were slated to receive funding. Fearing the president’s so-called anti-Muslim bias, three groups decided not to seek the grants. Two organizations were not awarded funding. DHS revoked grants from Life After Hate, a group focused on countering far-right extremism and white supremacy, and University of North Carolina – Chapel Hill, which fights jihadist and white supremacist recruiting. A Homeland Security spokesperson said the department rejected their grant application because they did not work with law enforcement, not because their missions are to prevent white supremacist recruitment.